The bus from Tiberias drove south, as far south as you can go in Israel. We slowly descended to the Dead Sea which, at 417 meters below sea level, is the lowest spot on earth. Crusted salt deposited clung to the shore line. The air was hazy with sand blowing in from Egypt. All day we drove along a solid wall of light brown mountains to the east – behind which we knew was Jordan. Via Jericho and Masada, we drove south through the Negev desert. Considering that the bus cost us only about $25.-, the bus seems to be one of the most economic ways to travel throughout Israel. Eilat, the southern most town in Israel, was a disappointment. It seemed a dusty, run-down version of Las Vegas with glitzy hotels, a small strip of beach and lots of amusement places. The worst thing was the airport. It is right smack in the middle of town. Huge airplanes come thundering over, missing the mall by a few feet. You can sit sipping beer on the beach and watch the belly of an airplane come right overhead. We were glad we hadn’t planned on spending more than one night here. The next morning we took a taxi to the Jordanian border. The paperwork on the Israeli side took perhaps a half hour because of line ups. The Jordan side was faster. Then we sat sipping Turkish coffee until our taxi showed up. 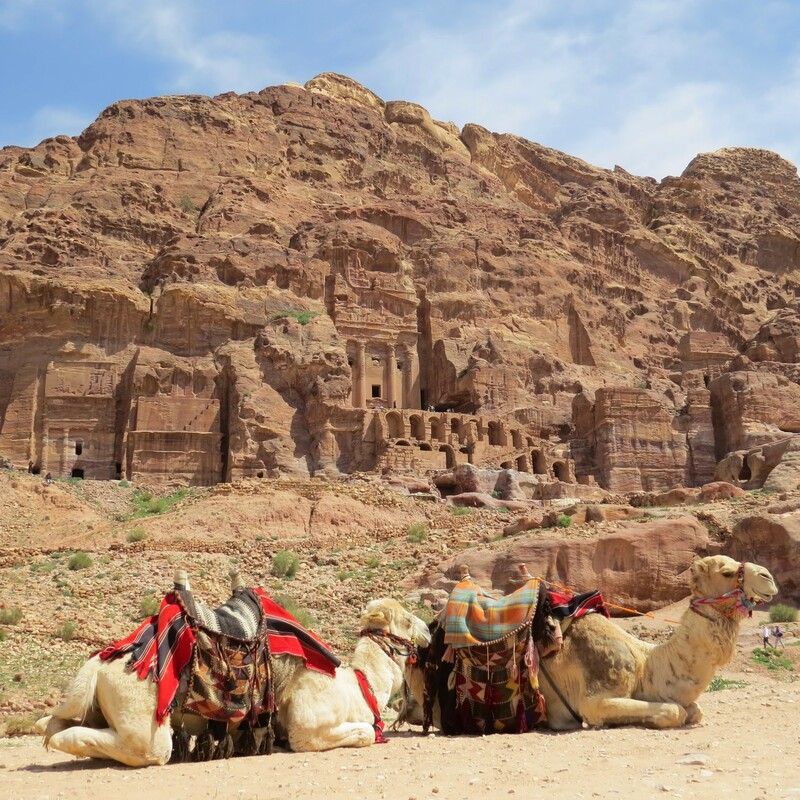 We had booked this via our accommodations in Petra. A beautiful new car with a lovely guy who spoke English picked us up and drove us the 2 hours to Petra, at a very reasonable rate. We decided to be brave and booked a 3 night stay in a tent. And we were glad we did. To us, three nights was the perfect length of time. The camp turned out to be a collection of square white tents, with inner and outer shells, a sold frame with a door. Inside were two metal bed frames with a big soft mattress, topped by 3 heavy blankets. When we crawled in at night, we felt like we were in a big warm nest surrounded by cool desert air and no sounds at all. Until 6 AM when bleating sheep strolled by. And until our last night when we laid awake listening to the distant thunder of shooting in the Gaza strip. We only had electricity between 7 PM and 11 PM but didn’t miss anything. Internet was turned on for about an hour at night and one could see why it was so limited. As soon as they had internet, guests were staring at their devices instead of talking to each other! We met people from all over the world in this camp, and there were only about 14 people there at the same time, which was lovely and quiet. On the first night we were told that they made a point of serving something different for dinner every night. Every night we had rice, chicken, salad and potatoes. It was good – but no variety :-)The camp was run by several very nice, friendly young guys. They were very thoughtful and kind, bringing us tea, offering rides, etc. At night they played a traditional string instrument and a drum, singing long, soulful ballads in Arabic. At US 45.- p.p. for one night, including breakfast AND dinner, this was likely a fraction of the cost of one of the fancy hotels and we thoroughly enjoyed the experience. 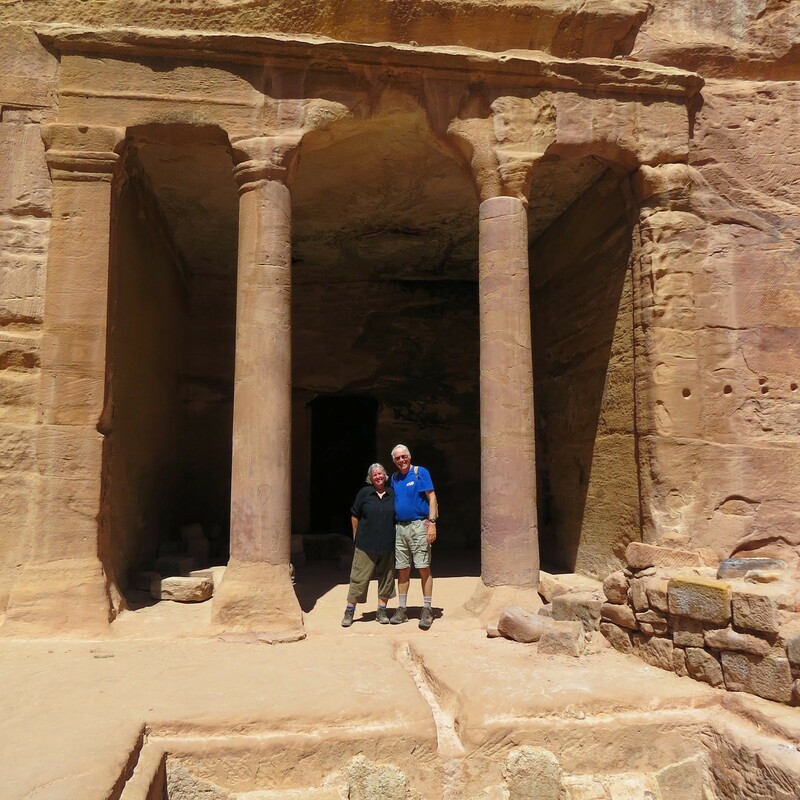 On our first afternoon, we strolled down to “Little Petra” – a small version of cave dwellings and carved facades, which is still ‘in the wild’ without entrance fee or any protection. It was a Friday afternoon – weekend for the Muslims who were out in full force: family after family squatting in the shade of rocks, making campfires, cooking tea and grilling meat. Children were running everywhere, women sat in the shade visiting. Smoke twirled up behind every rock from their little fires while they laughed and sang and enjoyed a sunny afternoon. When I watch a real shepherd, complete with crook, walking through a field of boulders with his flock, wearing a long black dress and flowing head scarves, I marvel at how little seems to have changed in this area over the ages. Our dinner is cooked in a pit in the ground. 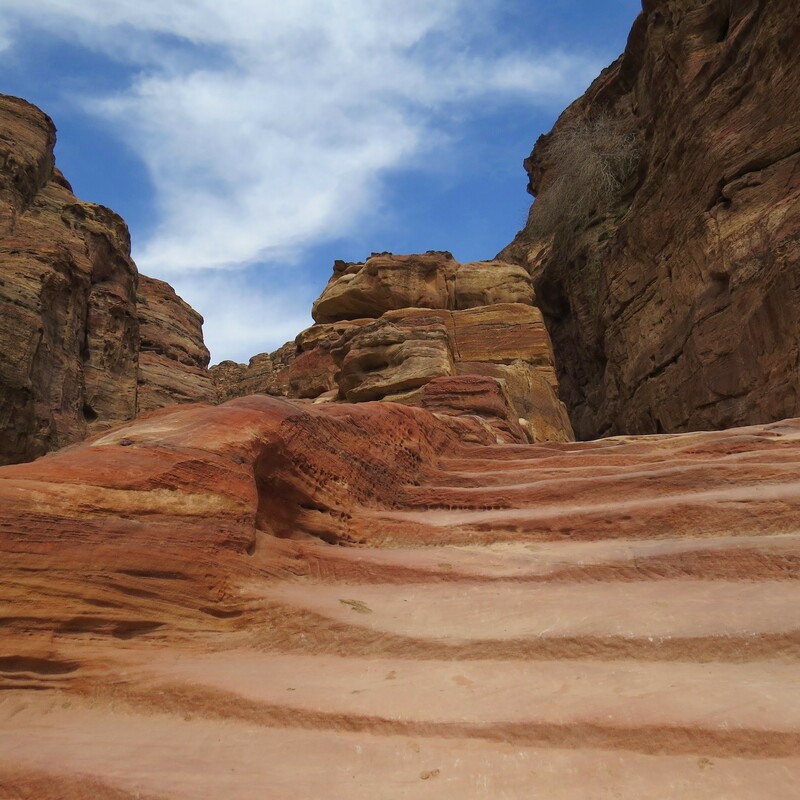 Petra – truly one of the Wonders of the World. How can words describe the world wonder that is Petra? And that proved to be true. I had read about the Nabataeans who lived here more than 2,000 years ago. How they carved facades of buildings out of the rocks in which they made their homes. About how Romans eventually conquered them by cutting off their ingenious water supply systems. I had seen many pictures of the red rock carvings. I knew from tourist information that the Siq, the long steep gorge leading to the site, was over a kilometer long. But indeed nothing prepared me for that first sight. It truly did take my breath away and left me all choked up. Beforehand, I had found it hard to picture it all. Turns out that ‘Petra’ only refers to the actual archeological site itself. The town immediately around it is called Wadi Musa. That’s where the hotels, the restaurants and everything else is. But there’s a part of town right outside Petra, so that you can walk there. And then there’s most of Wadi Musa which is way up on the hills and much too far to walk. Our Bedouin Camp was a 10 minute drive away, near Little Petra – a small, more natural side of cave dwellings, not incorporated into the preserved area. Our camp offered rides to and from Petra whenever we needed them. Entrance tickets are expensive: 50 dinars (about $75.-) for one day, 55 dinars for 2 days. So we bought 2 day tickets, which really is the minimum you need to do the place justice. We walked past the customary tourist traps toward the Siq – a good 10 minute walk. The Siq is a canyon with steep rock faces on either side, sometimes not more than 2 meters wide. I was surprised to see that most of the ground surface is ‘pavement’ – even when it is ancient Roman roads. Inside the Siq it is cool and shaded. After just over a kilometer, you spot a top glimpse of ‘The Treasury’. A few more paces and you emerge from the shade onto a large, dirt ‘market place’. At first glance all you see is The Treasury: sunlight paints this facade orange. It towers almost 40 meters high. Especially when people stand in front of it, you realize how huge it is. How did these people carve these facades, and pillars? Did they build scaffolding? Use ropes? It boggles the mind to think these masterpieces were made some 2,000 years ago. The other thing I had not quite realized, is that Petra is not the odd ancient building, but the actual remnants of a large city. Once you emerge from the Siq, you enter what once was a complete and bustling city. Old roads are still visible, some lined with columns. There are many homes, also used as tombs. Besides the large Treasury, there are many other major buildings, including the Monastery. There is a large amphitheater and numerous other buildings. It is believed that some 20,000 Nabataeans lived here. 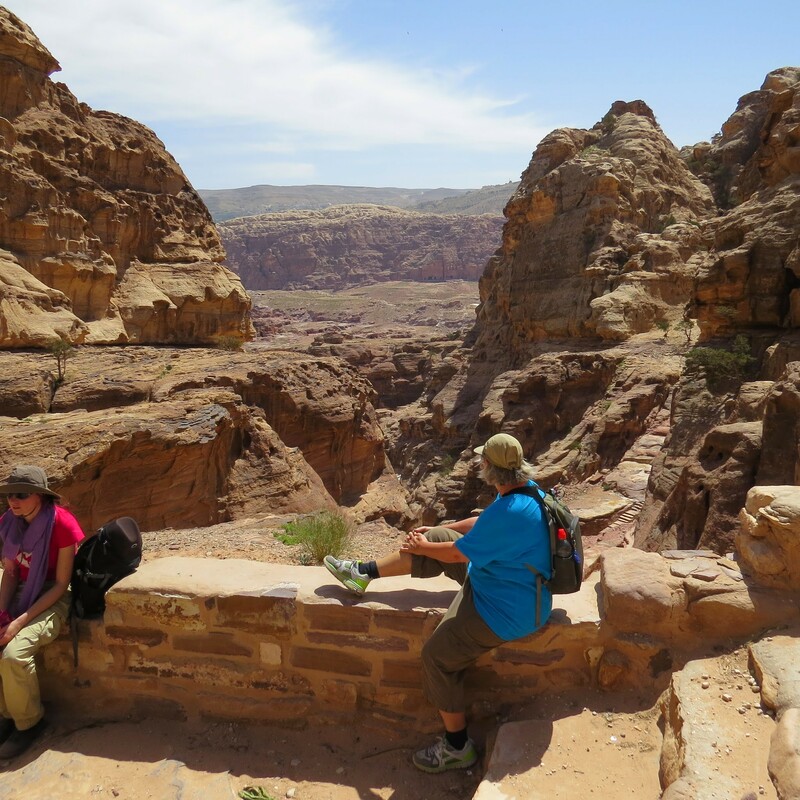 Walking around Petra all day, climbing staircase after staircase, I kept thinking of the Swiss traveler who rediscovered Petra in the early 1800’s. He would have been so amazed to come across these unexpected sights. Petra was, by then, a city in ruins and used by Bedouin who made their homes in the convenient caves. 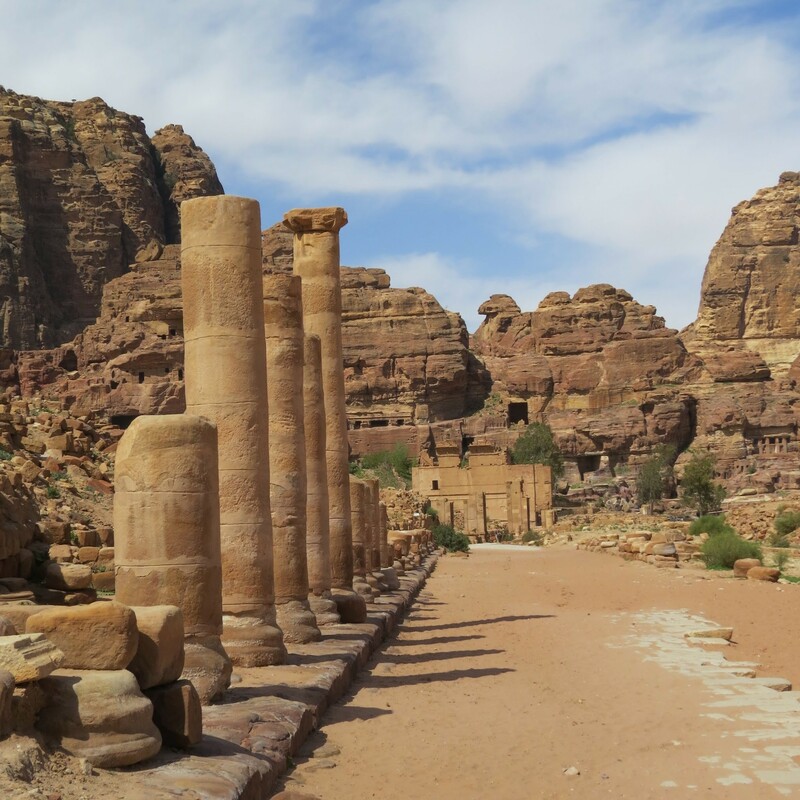 It is believed that only 15% of Petra has been uncovered today. Perhaps one day scientists will learn why the Nabataeans seized to exist. We walked in the hot sunshine, climbing, scrambling over rocks. Two days gave us a good impression. I wouldn’t want to “do” Petra in any less than that. The Bedouin women everywhere try to sell you jewelry, tea, anything. I was shocked to see little children, as young as 5 years old, selling postcards to tourists. The book is a fascinating account of an unusual life. After her husband died, she left but has now returned to Petra to make silver jewelry with local women. It was fun to meet the author and chat with her. She confirmed that those little Bedouin children should be in school and that tourists should avoid buying from them. Every penny they earn is discouragement to send them to school. I am forever grateful that we were able to visit Petra and see the amazing sites with our own eyes. Hope you can visit it, too, some day.